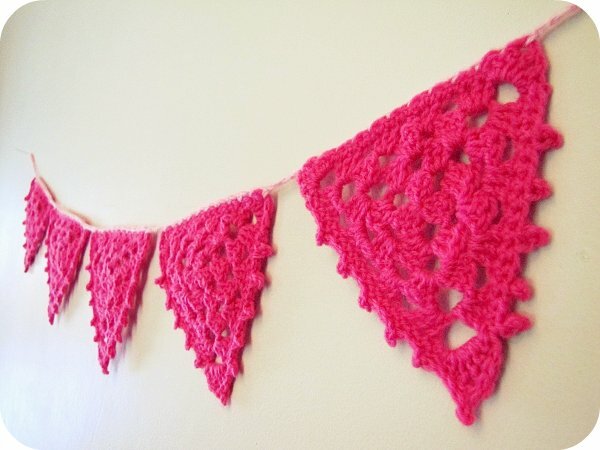 Since I've already owned up to being a total Granny, I have no shame in showing off my pink Granny Bunting (thanks to Crochet with Raymond for the tutorial)! 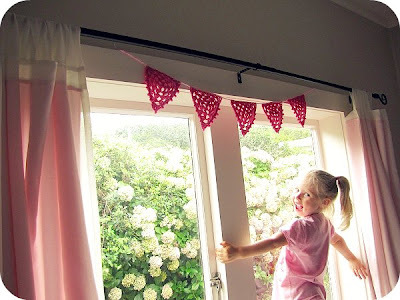 I love bunting, but have only ever made fabric bunting before (here & here). 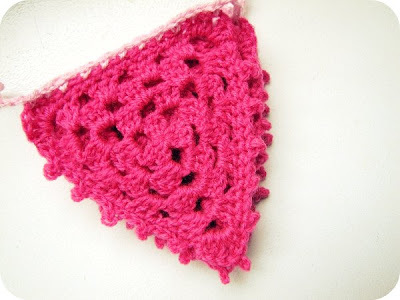 This crochet bunting was really fun and quite simple to make. I can see how it could get addictive... the only thing holding me back from making more was seeing (once again) the colour draining from my husbands face as I held the bunting up in the girls room to ask him for his opinion. Anyway, the girls think it is fab, I like it, and I'm off now to crochet my husband a little cute chain of Granny Bunting to hang in his car. you are fab....he is SO out of touch! So bright and cheery! I love it! Can't believe how fast you whip stuff up! i am DEF going to learn to crochet this winter! I LOVE the granny bunting!!! has a chuckle at Simone's colourless face!!! And the hot pink is wicked. Such a cute and clever little idea! Haha! I laughed out loud at the thought of bunting in the car. CUTE! And so funny. A whole world of previously undiscovered girliness just opened up in my mind!!! I love bunting and your granny bunting totally rocks!! oh I totally LOVE it!! Yes, your hubby is obviously out of touch..lol. Im also going to have to get my crochet sorted!! Love it! How about a giant crocheted set of dice for his car???? Ahhh LOVE this would be an amazing little touch at our wedding, note taking out loud. That is so cute... and I LOVE the hot pink color! Love it! It looks so gorgeous in your beautiful daughter's room! But I absolutely think you need to make another set to stretch right across the window, and then maybe a set for the door too! Ooh... my darling would die if I put bunting in the car, it made me smile to think about her reaction!!!!! VERY COOL!! Not 'Granny' at all!! Love it. I have the same problem with my other half. It's amazing how they can go pale at the very sight of something beautifully handmade isn't it? I think if you make him some for his car it may be grounds for divorce though! Re: Symons comment. My Nanna made me a crochet bikini for my 12th birthday. They really don't work. Wet lacy cotton is just not a good look for bikinis! Well, I love the granny bunting! Perfect for a little's room! And yes - he is a wee bit out of touch! Bunting rules! I've never seen crocheted bunting before but it lets the light through in a lovely way. Awesome! Looks like you got the vote of approval from the ones the count though! The girls look like they think it is awesome. Go Granny bunting! What colors does hubby get? Red for Valentines Day? and when your daughter is bigger you can turn it into bikinis. My husband is out of touch also, I think most men have no idea basically. It looks great! Another Granny here and loving it! Love the pic of your girl, she looks very proud of her bunting! I'm majorly in love with this bunting. seriously, amazing! Meredy at Count It All Joy recommended your blog and after scrolling through, it was this Granny bunting that convinced me that I would love to receive regular gifts of fun from you - so now I'm your newest follower. I am so glad I am following your blog!!! love this idea and thanks for passing along Raymonds blog. Looks like I need to get better at my "reading" crochet instructions. I have learned manly from youtube videos. Blessings!